Gorgeous antique 19th century Victorian Gold~filled Bar Pin, with lovely etched detailing, Etruscan in style. Between 1860-80 the Victorians were very much enamored with "archaeological findings" of the day, these pieces were the very height of fashion. 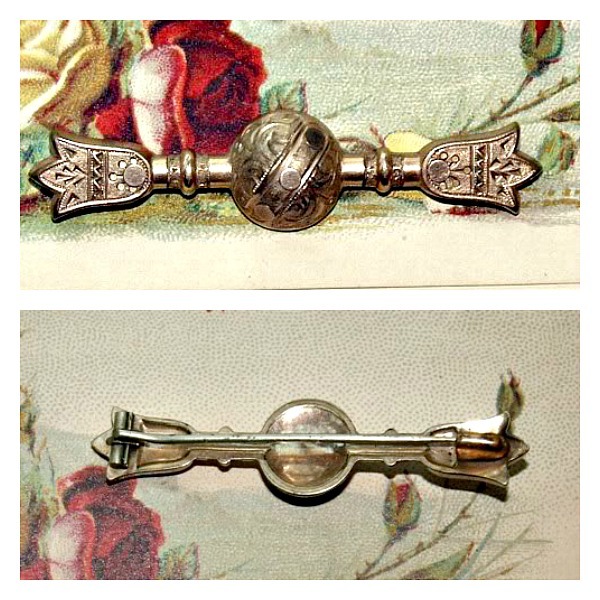 Victorian ladies wore bar pins like this at the top of their dress or blouse collars, along with their "daily" necklace which usually held a locket. Measures 2~3/8" long x 1/2" wide, tubular closing in the back.